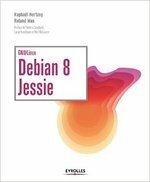 The traditional way to mount Windows (or Samba) shares involves hardcoding the credentials in a plain-text file and some /etc/fstab entry to mount it automatically at boot time. If you don’t want to store a plain-text copy of your password, you’re bound to mount your shares interactively. 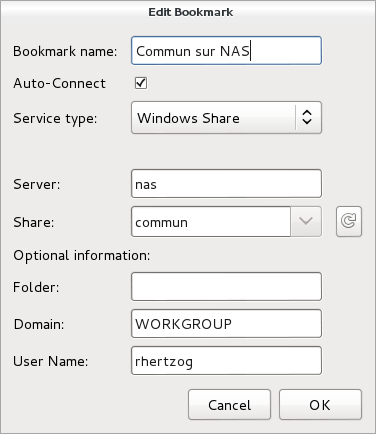 This is clearly sub-optimal and I thought that there must be a better way to handle this in the context of a GNOME desktop (which already supports connecting to such shares in the file browser). So I looked for a solution and after a bit of googling I found one. Launch Gigolo, setup your shares as bookmarks and mark them as “Auto-Connect”. During (first) connection, you will be prompted for your password and you have the possibility to store it in the GNOME keyring (and here it’s encrypted, not in plain-text!). 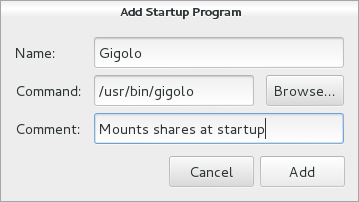 The main limitation is that those shares are not real mounts, instead they are available within GNOME’s virtual file system (GVFS). 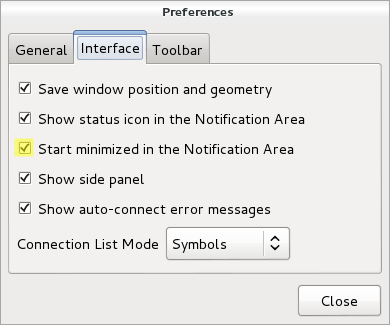 If you use only 100% GNOME application, then it’s not a problem but otherwise it’s pretty annoying. You can’t “cd” in those shares from a terminal for example. By the way, I haven’t found a way to use a non-hidden directory so if you want this directory to be more visible, I suggest that you create a symlink pointing to it. Do you want to read more HOWTO like this one? Click here to subscribe to my free newsletter, you can opt to receive future articles by email.